Brussels is on the list. As in, someday I'd like to go. Someday won't be any day soon, but if it were I think I'd book in at this hotel. I know it's a total gimmick but, what can I say? I've fallen for it. The Pantone Hotel in Brussels is design/colour geek heaven. Amazing what a couple of coloured glass panels can do to liven up an otherwise total snorfest of a building. This room please. Green is my favourite. Would be a total no-brainer to design a bathroom like this. Pure white fixtures, tile and towels, plus bright accessories. Done and done. I'd strategize a day of antiquing and eating moules frites here before hopping on one of the aforementioned bicyclettes. Again, you would def want to nick these, but they wouldn't fit in the suitcase anyway. The whole place has the vibe of a graphic design college dorm - but that's what I like about it. The new Pantone cosmetics line which launched recently at Sephora. Or this little lovely for my phone in my signature colour: 354. I hope you have a bright and colourful week. Check back, I have a couple of other ideas to share in the coming days. 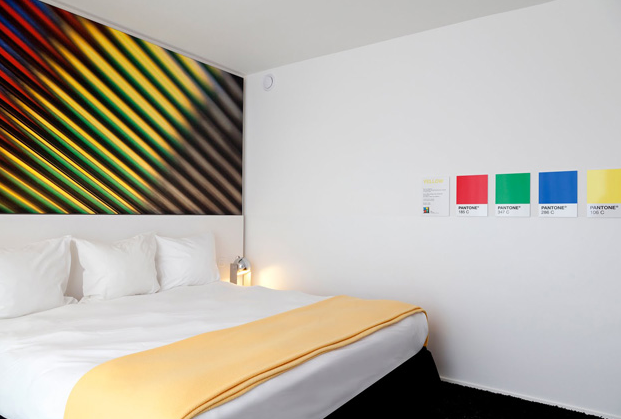 all hotel photos: The Pantone Hotel.